As if every Sunday were not sufficiently a Holy Day of Obligation, today is Pentecost — and we’ll be driving all day. Prayers and thanksgivings and solidarity with our sisters and brothers in worship today, and our heartfelt wishes for a time when the truth will again be heard and understood by all, each in their own idiom. Pentecostal blessings on you all! I’ve been thinking hard about Jeff’s recent post (as I almost always do), and his reflections resonate powerfully with my own experiences and ideas. Most obviously, it’s not at all clear that I’ll have an academic job this coming year, while my wife has secured an appointment; secondarily, I share Jeff’s interest in the importance of visual rhetoric, and some of the estrangement that tends to engender among disciplinary colleagues who perceive only the verbal dimension of biblical scholarship. Jeff has long been a vital provocateur for my thinking about visual communication; while I don’t always agree with him, I tend to suppose it’s because he’s smarter, an exceptionally gifted photographer, and more well-read. Way back in Inter-Web antiquity, a number of us played with the conceit of a University of Blogaria, but wouldn’t my neurons sizzle if I could [collaborate with] Jeff in some mode of non-institutional teaching/arguing/theorizing about rhetoric, communication, composition, argumentation, hermeneutics, and so on. And cheers and best wishes to Jeff and Krista! Safe arrival at Baltimore, preparing for Margaret’s faculty dinner, leaving tomorrow for Cleveland (“city of light, city of magic”). Some people say “[I] have no dog in this hunt” (Google = 10.4K), and others “[I] have no dog in this fight” (Google = 116K). Now, competent readers recognize both expressions as colorful ways of disclaiming interest, so it would be mistaken to ask “which is right?” I wonder, though, whether one arose out of the other, or each developed more or less simultaneously/autonomously. Given the tradition of hunting with packs of dogs in England, I’d suspect (without direct evidence) that “hunt” came first: “I can speculate disinterestedly about which dog will turn up a pheasant first, because I don’t have a dog in the contest.” Among people less accustomed to hunting with packs of dogs, the more intelligible version would transmute the trope to the practice of dog fighting. But that’s 100% speculation. If there were a convenient way to send up a flare to Language Log in general, rather than picking on one of the Loggers, I’d refer it to them — but for now, I’ll just leave my ruminations here. Attention, parents: the wee little children whom we raised from potato-sized lumps (or, in Si’s case, a potato-sack sized lump) are growing up! In fact — and this is the vital headline — just a week from Saturday, Josiah will be getting married! As a public service announcement to the parents of small children who read this blog (you know who you are), be alert! This could happen to you! Deirdre Good first pointed me to this image, and now I’ve pinned down the specifics of its provenance, so I wanted to post about it here (for the sake of declining memory). It’s a depiction of St Matthew (on the right — not sure who the other saint is) from the rood screen at St Agnes Church, Cawston, Norfolk. As Boing Boing provides a unicorn chaser whenever they post especially gory (or otherwise disturbing) images, I take the opportunity to alleviate the leaden seriousness of the exegesis series by posting a picture of our neighbor, with whom we had dinner the other night. Luke’s sweet and talkative and fascinated with all manner of animal life and very active. 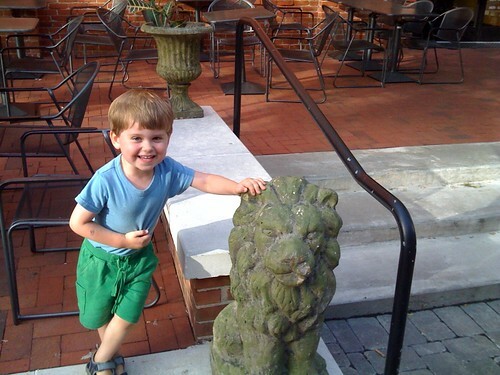 I was lucky to catch this moment in a sequence of photos of him wriggling around the stone lion. Greg Carey and Joel Green are talking about the theological interpretation of Scripture on Facebook and on Greg’s blog. While they’re both among the NT scholars I respect as thoughtful explorers of this terrain, I’m not convinced that their conversation gets biblical theologians past the impasse that has frustrated interpreters for several decades (but then, I would think so). Many of the confusions that arise in exegetical inquiry come from the extrinsic factors we’ve been discussing: the ambiguous technical terms, the unstated expectations, the literary genres in which students write, and the multifarious contexts that pertain to interpretive reflection. At the same time, a great deal of the complexity in learning exegesis arises from the fact that we’re working with language. Language sometimes seems so simple that readers pursue their interpretations of the Bible with vigorous reliance on plain common sense. At other times, even casual readers detect intricacies that defy convenient resolution. Moreover, different readers will identify different texts as “transparent” or “opaque”; the text itself provides no marker that indicates “The following bits will be hard to figure out,” or “This last part should have been immediately intelligible to you.” The unpredictably intermittent clarity or murkiness of linguistic expression makes exegesis that much more complicated. The interpretation of linguistic texts poses even greater challenges to readers whose fluency in a language, even their own native language, may not include the capacity for rigorous critical reflection on the syntax and semantics of the text in question. Many students, for instance, have difficulty learning additional languages because they have not learned the internal mechanics of their own language, and that difficulty may be amplified for students who know a non-standard dialect of their indigenous language better than they know the standard version. Few people write particularly well, and most resist refining the deeply-ingrained compositional habits they acquired as early as grade school. If students do not communicate with critical fluency in their native language, they will probably write that much less clearly and comprehend the texts they read less satisfactorily. Thus, language in itself entails one of the problematic dimensions of exegesis. The problem of language intensifies, however, as we consider the role of multiple languages in exegesis. Students reading and writing exclusively in one language nonetheless rely on translations and multilingual scholarship produced by others. The monolingual interpreter then faces the enigma of how to adopt one particular translation (or to weigh various translations) without even minimal fluency in the source language. Monolingual interpreters may rely on trusted scholarly authorities, but when scholarly authorities disagree, the monolingual interpreter must take a guess as to which figure to rely on. Yet not all scholarly authorities attain the same degree of fluency in any given language, and the Hebraist of superb refinement may read Greek inexpertly; or, more commonly, qualified working scholars may simply read other languages with competence, but without subtlety or grace (and “subtlety” and “grace” are notoriously difficult to teach or to pin down in evaluation). The monolingual reader must cope with problems of interpretation and expression in one language, while also allowing for even greater problems of interpretation and expression in unknown languages. The importance of translation for biblical interpretation engenders one further fillip of complication. Translators generally work under the obligation of producing a representation in a target language of what they take the source text to express — fair enough. But In many cases, the source text involves ambiguities, allusions, and connotations that cannot be represented equally in any one translated phrase. The greater problem, though, is not the deficiency of any single translation; the greater problem is the latent proclivity to treat translation as a normative activity for interpreters of the Bible, such that the lurking obligation of arriving at one correct definitive translation shapes the work, the deliberation, and rhetoric of biblical interpreters. Since a translation must, in the end, adopt one representation of each expressive unit; and since the tradition of biblical interpretation has emphatically promoted the Bible’s availability in translation (as opposed, for instance, to the Qu’ranic tradition); and since theological argumentation typically puts a very high value on biblical warrants; hence, the interpretive activity of translating has held center stage for biblical scholars, the disciplinary discourse of biblical scholarship gravitates toward a univocity that fits the requirements of translation and polemics. Scholars may argue about extent to which textual “meaning” is determinate and univocal — I doubt both characterizations — but regardless of the philosophical status of textual univocity, that axiom not only fuels academic and ecclesiastical controversy, but also underwrites badly-written, dizzyingly-profitable best-selling novels. Moreover, in so doing, it perpetuates a disabling misconception about communication and the Bible: the idea that texts encode a concealed meaning that only the right interpreters can unveil. On one hand, this sensibility produces The Bible Code and The da Vinci Code ; on the other, the Left Behind potboilers. All of these rest on the premise that a non-obvious meaning lurks behind the familiar surface of the Bible that unenlightened readers have been interpreting for centuries. Several possible objections should come to mind right away: first, if this is the real, true meaning of the Bible, why did no one identify it before the late nineteenth century? What of all those brilliant-but-presumably-hapless scholars who actually read the Bible fluently in its original languages? However one explains away those queries, though, the more disquieting aspect of the “coded Bible” axiom lies in the extent to which it mirrors the figure of the academic discipline of biblical studies, which frequently represents itself as a revelatory discourse of truth that banishes the misconceptions prevalent among untrained interpreters (especially ecclesiastical interpreters). The epithet “pre-critical” that historians of interpretation used to deploy without hesitation betrays the condescension with which modern scholars have treated their predecessors in the field. As long as contemporary critics insist on the axiom that the Bible encodes a “real meaning” that only the true experts can decrypt, they play into the hands of opponents who contest the qualifications for “true scholarship” rather than contributing to a richer discussion of what makes for sounder biblical interpretations. In order to help interpreters to practice sound, well-informed exegesis, teachers must attend to the ways that language itself, and their students’ relation to language, and their assumptions about language, all make exegesis more difficult. Teachers should watch out for the effects of monolingualism on their students, should encourage students to a more critical relation to their own most comfortable modes of linguistic expression, and should exemplify both appropriate humility about their mastery of various languages and their appreciation of the tremendous value of learning more Hebrew and Greek (and for practically everyone, there is always more to learn). At the same time, teachers should steer clear of suggesting that knowledge of the original biblical languages affords students with a supernatural anointing that licenses them to know and preach “what this or that really means.” If teachers opt to uphold some model that posits an encrypted meaning subsisting in the text, they should extend themselves to display (to the extent possible) how one can distinguish well-founded practices of decryption from impoverished, misleading interpretive decryption. Over the months that I’ve been an eMusic subscriber, I’ve seen a lot of recordings in which I felt no interest whatever, and an increasing number of recordings that I already own on CD (or that I have pre-eMusic digital versions of). I’m pleased, though, to observe that performers such as Al Green and Joan Jett have released their back catalogs on eMusic, and in so doing have appeared consistently among the top downloads charts. I understand that Bob Dylan, for instance, may expect that he stands to gain more by withholding his recordings from eMusic than he would by releasing his catalog through them. But what about the hundreds of mid-listers, some of them exceptional musicians, whose market profile more closely resembles Al Green than Bob Dylan? If they think they’re going to milk the hard-copy music industry for another promotional push, they’re quite likely deluded. So do not ask for whom the clue phone rings — it rings for them. I also appreciated the earlier note that “The ratio of vertebrate paleontologists to actual specimens is high, which makes for a lot of theorizing”; while that ratio may be high, I’d guess it’s not nearly as high as the ratio of biblical experts (including the self-appointed ones) to biblical manuscripts. College friend Paul Bolster (with whom we reconnected at last year’s reunion) appears on NPR’s Morning Edition today — bravo, Paul!